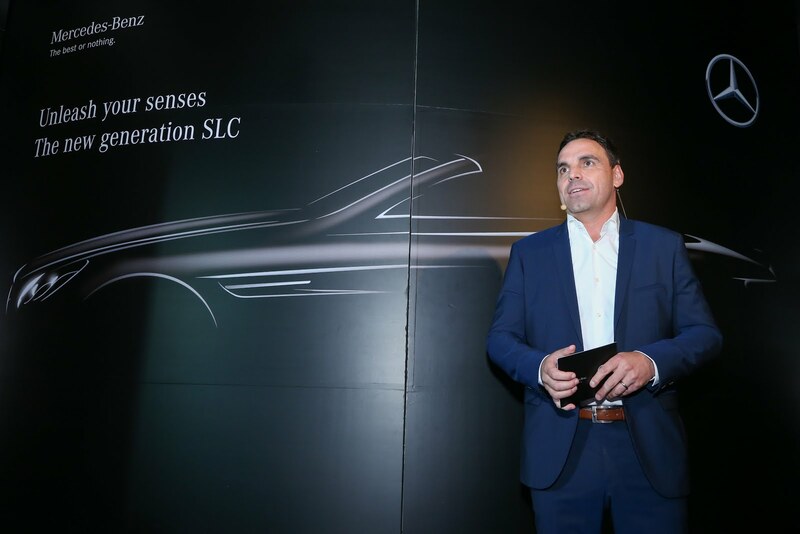 Mercedes-Benz announced the newly renamed compact roadster the SLC which signifies state-of- the-art technology and out-of- this-world appearance. The name change acknowledges the close relationship with the C-Class, from which the roadster is technically derived. The new Mercedes-Benz SLC is transformed from its predecessor, the SLK that achieved sales of around 670,000 units. After a facelift, the compact roadster is sportier than ever with a new front section featuring a steeply raked radiator grille that elongates the look of the arrow-shaped bonnet. The equipped sport/comfort-oriented 9G-TRONIC automatic transmission, together with the 1991cc four-cylinder engine, ensure excellent performance with an output of 184 hp for the SLC 200 and 245 hp for the SLC 300. With DYNAMIC SELECT the vehicle characteristics can be adjusted with just a touch of the button, as the system modifies the engine, transmission, steering and suspension at the driver’s command. The SLC’s vari-roof is even more straightforward to operate and provides the driving pleasure of an open top. The larger display, electroplated control elements and enhanced interior design further emphasise the high-quality look of the new SLC inside and out. As the new addition with most dynamic to the line-up and part of the AMG family, the Mercedes-AMG SLC 43 delivers driving performance in impressive style. Sharing the same striking appearance as other SLC models, the SLC 43 is powered by a 3.0-litre V6 biturbo engine and has an output of 367 hp and a maximum torque of 520 Nm. It features a modified version of the AMG sports suspension familiar from the Mercedes-AMG SLK 55. Combined with the sport/comfort-oriented 9G-TRONIC automatic transmission, it guarantees sporty performance figures. The compact roadster accelerates from 0 to 100 km/h in 4.7 seconds, celebrating optimised technology with its powerful performance.